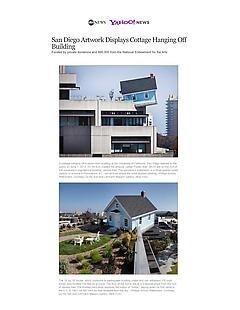 A cottage hanging off a seven-floor building at the University of California, San Diego opened to the public on June 7, 2012. Do Ho Suh created the artwork, called "Fallen Star" which sits on the roof of the university's engineering building, Jacobs Hall. The permanent installation is a three-quarter-sized version of a home in Providence, R.I., not far from where the artist studied painting. The 15' by 18' house, which conforms to earthquake building codes and can withstand 100 mph winds, was hoisted 100 feet by a crane. The floor of the home sits at a 5-degree angle from the roof of Jacobs Hall. The Korean-born artist explores the notion of "home," saying when he first came to the U.S. in 1991, he felt "as if he was dropped from the sky." Visitors can visit for free the inside of the home by appointment. The photographs on the mantle include baby pictures of the university's Jacobs School of Engineering deans and photos of donors' families. The rocking chair is an heirloom from the family of Mary Beebe, director of the Stuart Collection at UC San Diego. Steam, simulating smoke, sometimes rises from the chimney.